Over the years, customers have asked us questions about the ways that their flooring and flooring accessories can affect their building’s LEED certification. Can they really make a difference? Take a moment to think about the amount of your building’s surface area is covered with flooring, and you’ll realize the major impact the flooring you choose will have on your project’s overall sustainability. 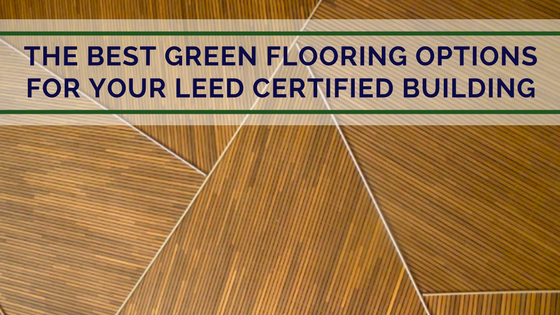 Where Can You Find LEED Certified Flooring? There’s no such thing as LEED certified flooring - the USGBC does not certify building materials. However, green flooring options can add credit to your LEED application. Is the flooring made of recycled content? Is the flooring sourced locally? Is the flooring made from low-emitting materials? If you can answer yes to the questions above, your flooring could add credit to your LEED application. Historically, carpet hasn’t been considered the most green option, mostly because of the huge amounts of waste it can create - over four billion pounds of waste annually, according to the EPA. As sustainability becomes a greater concern, the carpet industry has responded by developing new and innovative earth-friendly options, like carpets that are 100% recyclable. The most environmentally-friendly carpet options are made of natural fibers (like wool, jute, cotton, and sisal) or recycled materials. When trying to determine the carpet that’s most green, make sure to consider the environmental impact of all aspects of the carpet, like backing systems and cushioning in addition to the visible fibers. These aspects play a role in determining carpets’ recycled content on a building’s LEED application. Carpet tiles don’t seem particularly green from the outset because they require more materials during production than standard carpet. This is because of their thick backing. However, they often end up being a greener choice over time because, in the case of damage, a single tile or section of tiles can be removed instead of wasting an entire wall-to-wall carpet. As you know, carpet replacement is a major undertaking. Its cost goes beyond the time and money required to rip up the old carpet and reinstal the new one - it also has an environmental cost when the carpet is simply discarded and sent to a landfill. Carpet waste is no small blip on the environmental radar. In fact, the EPA estimates that carpet accounts for four billion pounds of waste annually. So, instead of sending old carpet to the landfill, consider recycling it. Contact the Carpet America Recovery Effort, a non-profit dedicated to reducing carpet waste and promoting recycling, offers a database of partners that will accept your old carpet for recycling to help you find a carpet collector in your region. The best marker of low-emitting carpet is the Carpet and Rug Institute’s (CRI) Green Label Plus, a designation developed to assure architects and builders that the products they specify meet the industry’s most rigorous standards for low emissions. Only the lowest-emitting carpets receive the Green Label Plus certification after undergoing testing in partnership with the Environmental Protection Agency (EPA) and the American Society for Testing and Materials (ASTM). These can help contribute credit toward your building’s LEED certification. If you specify a carpet that’s earned the Green Label Plus designation, you know you’re making an earth-friendly choice. Hardwood sounds like the easiest choice for green flooring since it is a natural resource, but there are some steps you should take to ensure you’re choosing the most environmentally friendly wood. The most green choices are salvaged or reclaimed wood, or wood that comes from forests certified by the Forest Stewardship Council (FSC), a non-profit organization that protects forests’ ecosystems, independently certifies forests based on their management, and certifies specific products that are proven to come from a sustainable, earth-friendly chain of custody. You can find FSC-certified companies and products in their database. Make sure to avoid any wood that has added formaldehyde or sealants that contain harmful VOCs. Bamboo is another great green flooring option. Its greatest feature is that it grows so quickly it can be harvested year after year. Plus, it doesn’t require fertilizer, pesticides, or much water. Choose bamboo that’s been certified by the FSC to ensure you’re making a green choice that can enhance your LEED application. Sustainable flooring lays the foundation for green building projects, and can even add valuable credit to your LEED application. What is LEED Certification and Why is it Valuable?